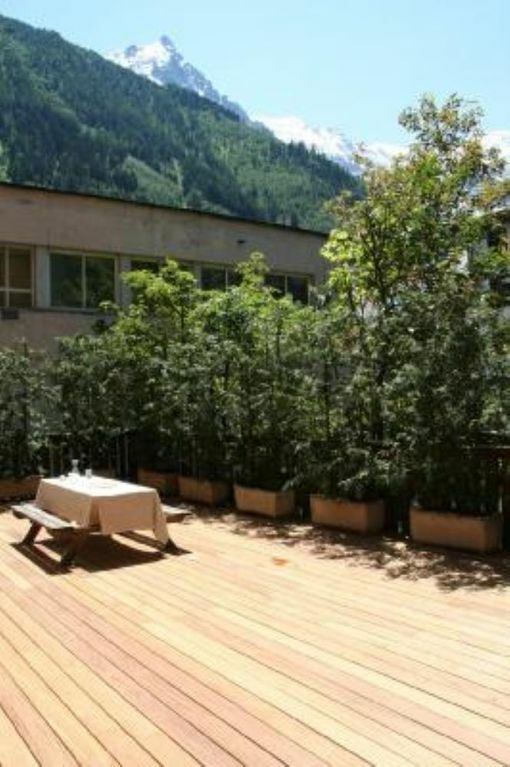 Light and revently renovated apartment in the heart of Chamonix. Magnificent private and sunny terrace, 70 m2, with barbecue, garden furniture, mountain view, etc. Mountain view from the terrace, the living room and from the bed of the master bedroom. Sleeps 8 people, 2 bathrooms, large open kitchen (fully equipped), large and light living room with very high ceiling and large glass-doors that open to the private terrace. Quality eqipment including HiFi with iPOd dock, flat screen TV, DVD, Wifi internet, etc. Ground floor is 85 m2 + mezzanine: 40m2. Located in the town centre, 100 m. from the main shopping street, 50 m. from the Aiguille du Midi cable car, 150 m. from fre ski shuttle that takes you to all the lifts of the valley, 20 m. from a ski/bike rental shop. (Kitchen, shower room, etc. was entirely renovated in 2013). We are a Danish family who used to live in the apartment and we keep it in excellent condition. Pay-service laundry/washing machines in the building. Parking spot in basement for one car. This is a really beautiful apartment that has well furnished and looked after and we loved it. The location was also superb. Be prepared for the two upstairs bedrooms to have ceilings so low that adults can't stand and to be charged extra for sheets, towels and cleaning. The apartment was very well equipped and presented and situated close to the centre of Chamonix and also the Aiguille Du Midi cable car. The off-street parking was a real bonus for us. Both the owner and the lady who met us in resort were very helpful. My only slight negative was the ceiling height on the mezzanine area which meant it was only really suitable for younger children however that didn't detract from a great stay in Chamonix and I would recommend the apartment for large families with younger children. "We were very happy, because we found such a nice place, like Rasmus had. It was clean, spacious, confortable, in the good location. The woman, who meet us, was friendly and she could answer to all our questions. Many thanks to Rasmus and his nice apartment - it was one part of our very nice vacation!" Lovely sport in the town centre. We found everything in excellent condition and super clean. Light and spacious apartment, and with fantastic views to the mountains from the living room and one of the bedrooms. We will be coming back ! Perfect location in the town centre. Apartment in excellent condition, new kitchen, new bath. Wonderfull living room where we could enjoy the views to the mountains. Le nettoyage professionnel de l’appartement après votre séjour est obligatoire, et coûte 60 EUROS. Vous devez le régler sur place en espèces à votre arrivée. Sur arrivée une caution d' EURO 400 a déposer en espèces. Cette caution vous sera remboursée après l’état des lieux, à condition que les lieux aient été restitués dans un état correct. Vous trouverez sur place tous les éléments indispensables, dont couettes et oreillers pour 8 personnes. Vous devez apporter: Linge de maison, torchons, serviettes de toilette, etc. Location de linge de maison possible sur place : (couchage EURO 15 par personne, serviette de toilette EURO 8).